Nifty futures on the daily timframe manage to hold with positive sentiment for the last 4 trading sessions with EOD support coming around 10258 levels. Interestingly Nifty Futures is trading around the higher timeframe reference level 50 day MA – 10244. Dec 2017 is completely filled with events hence there is no much of sticky long term money involved so far. On Day to Day basis this December series makret participants are dealing with more of shorter term buyers and short term sellers in Index derivatives. Volatility Index shooted up to 15.26(7.88%) as Gujarat Elections results are nearby. Tuesdays trading session starts with long liquidation and price attempted the P Shape Balance reference 10260 levels. Profile Sentiment remains positive for the 4th consecutive day despite value forming lower. Post the opening hour liquidation more of weaker shorter term sellers piled on quickly with possible stops built around 10300-10310 levels. 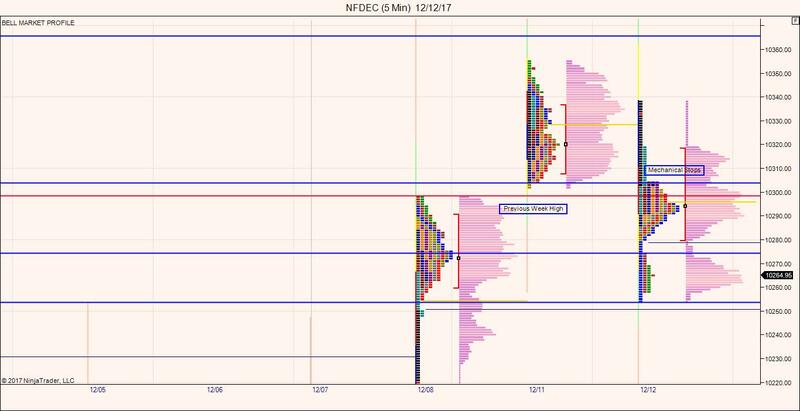 Price ended with a Double Distribution Structure on Tuesday. Presence of Prominent POC indicates that weaker short term players are rolling over their shorts with greater confidence. Tempo was quite slow for the day. Market Internals remains increasingly positive despite a intraday fall of 86 points in Nifty Futures on Tuesdays trading session. Put writing is currently seen at 10000PE, 10100PE, 10200PE levels. Is this training helpful for newbies in stock market, and how ? and what will be the expected amount to have for start automated trading system. I might be going to join your workshop kindly revert.